Restored and enhanced National Gallery of Ireland opens in Dublin. The Irish never need much of an excuse to celebrate. But this summer they have a deep and genuine cause for rejoicing. 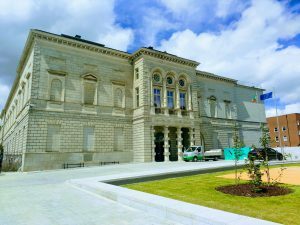 The restored and much-improved National Gallery of Ireland (NGI) opened in Dublin on June 15th (2017), after a six-year building programme in its historic wings. The project was a rare survivor of the rigorous budget-slashing which followed the 2008/09 financial crash. Many world cities have noteworthy galleries, but the NGI can claim a place at the very top of the second tier, just below the few undeniably pre-eminent collections, the Louvre, the Prado and the National Gallery in London. In rooms where the eye was more likely to be diverted by buckets collecting rain seeping through a leaky roof than dwelling on the paintings on the wall, the visitor can now take in fine to outstanding examples from 1000 years of Western art, from the earliest Renaissance masters such as Fra Angelico through to Monet and Picasso. The permanent collection includes works by Rembrandt, Caravaggio, Gainsborough, Goya and Vermeer, many of them presented by collectors in Ireland. There is also, as is entirely fitting, the best collection of Irish artists on show anywhere. The work has opened up original 19th century architectural features and spaces, in rooms in the Dargan and Milltown Wings closed for several years, and revealed majestic windows , allowing natural light to flood back into the galleries, where it is appropriate and doesn’t damage the paintings. The project included the construction of a new inner courtyard under a mainly glass roof, an underground energy centre and a climate, heating, fire suppression and lighting system fit for the 21st-century. The National Gallery of Ireland, facing onto Merrion Square in the heart of the Georgian city, is one of Europe’s earliest public art galleries. It opened in 1864. And, as if it needed it, there is a further inducement to the city’s many visitors from Europe, a large number of them young: entry is free.